Glistening in shinning gold and accented with colorful stones, this 5 Dzambala Prayer Wheel Keychain can safeguard your financial luck and enhance your wealth. Green Dzambhala represents success and fulfillment. White Dzambhala can increase wealth. Red Dzambhala can enhance prosperity and wealth. Yellow Dzambhala stands for good luck, longevity and widsom. Black Dzambhala can prevent from stealing and sickness. Therefore, 5 Dzambala Prayer Wheel Keychain can be also used as protection prayer wheel keychain that will bless one with protection against illness, hindrances, misfortunes, tragedies, spirit harm, and negative chi. The prayer wheel is a powerful symbol in Buddhism, and can ward off illnesses, negative chi, misfortunes, and tragedies. The prayer wheel can bless the soul with good fortune, distribute divine blessings, enhance compassion, and heal emotional and physical wounds. This 5 Dzambhala Prayer Wheel Keychain is spinnable. Spin it daily to bring success, good luck, wealth and protection. 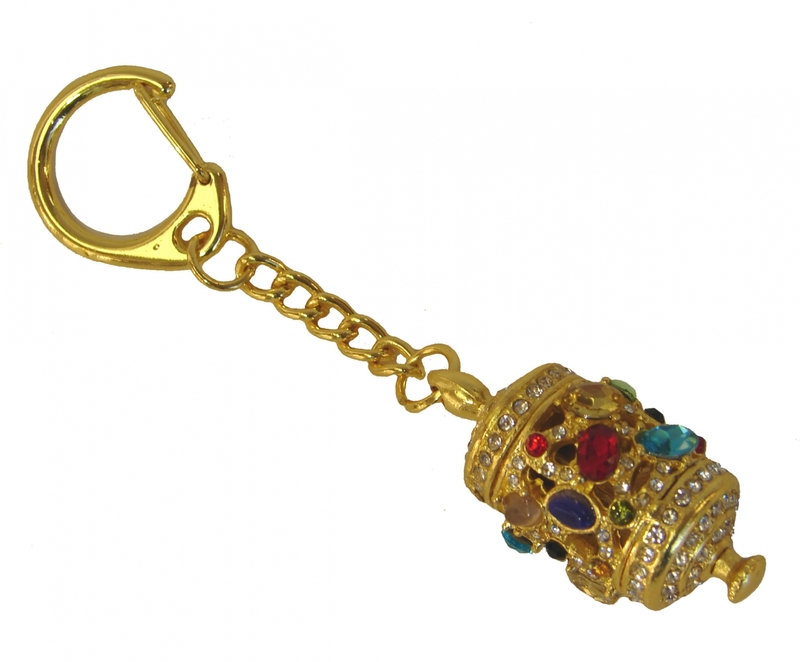 The dimension of the feng shui prayer wheel amulet keychain is approx. 4" in length. The dimension of the Prayer Wheel itself is approx. 0.75" x 0.75" x 1.5". It is made of alloy.